Tips: Batteries are not included. Please take it away ASAP!!! Multiple Tunes Inside: Castle in the Sky, Cotton Candy etc. Cute Design – the centerpiece is a Cute Unicorn. The on/off switch is at the bottom of the base. It plays merry little tune with different colored light. 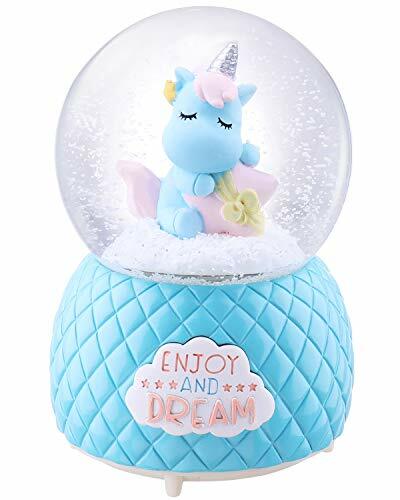 You will be enchanted by this musical snow globe. Gift Wrap – well-packed gift box with beautiful red ribbon bowknot. 樂Good Ideas – perfect as birthday, Christmas, Valentines Day & New Year gift for your kids, your girlfriend or anyone you like. ‍♀️Warm Reminder – for transport safety, the batteries are not included. 3 pcs AAA batteries needed.